Kiosk or Cart | Click on any image to view larger. The Aristo Crepes listing is a Kiosk or Cart dining location at Disney Springs featuring American cuisine. There are photos in the Mealtrip photo gallery for this location and dining period. The Aristo Crepes listing currently has a score of out of 100. 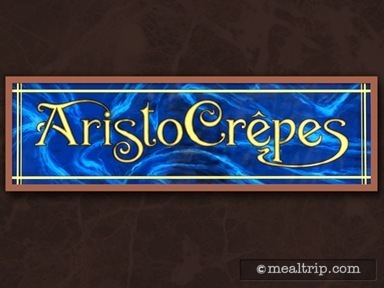 Click here to read all of the reviews for this location, or log in to Mealtrip.com to add your own review for Aristo Crepes. It doesn't look like there are any photos for this location yet! We are working to fill the Mealtrip directory up with photos as quickly as possible. Please check back again soon.